For holiday gifting, I love to put together gift baskets. 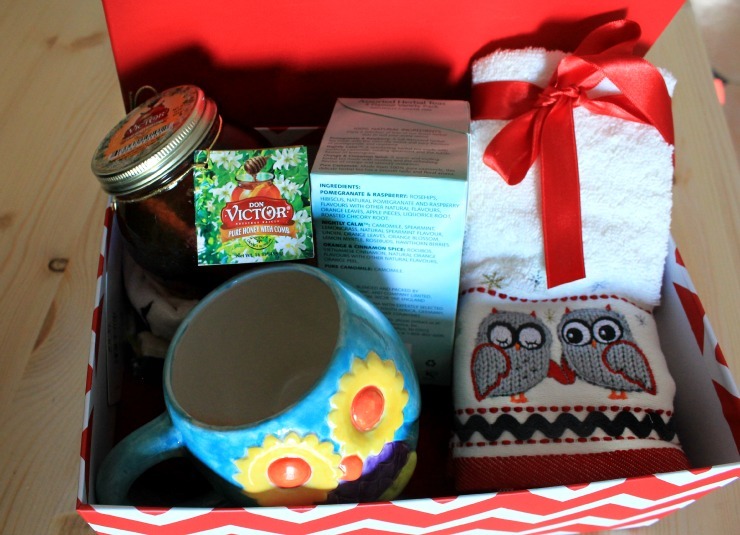 I feel like a gift basket is a gift you actually put thought into and feels very personal. One person I usually put a gift basket together for is my mom. My mom is very complicated to shop for so every year, I pick a theme and put a few things together in a basket that go with that theme. This year I am going for two themes: tea and owls. My mother is obsessed with both so I really can't go wrong with a basket incorporating both! 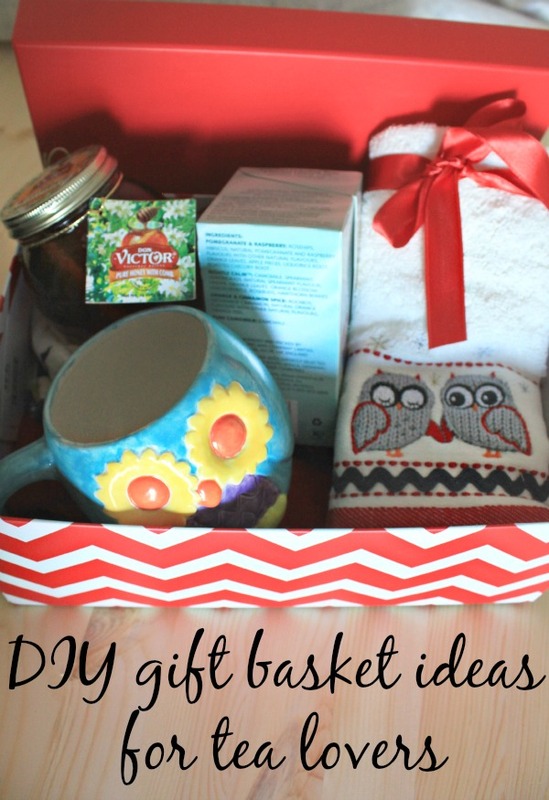 Gift baskets really aren't that complicated. My big trick is put everything in a small container, for instance a box. This way, you only put in a few things but it looks like a lot. For my mom's basket, I made an owl mug in a ceramics shop (very thoughtful, right?). I then went to the store and purchased a box of her favorite tea, an owl-themed set of tea towels, a pot of honey and a box to put everything in. You can't have tea without honey! I put a little bit of thought into the type of honey I wanted to include in the basket. Since my mom grew up in Cuba, I know how much she likes pure honey. Growing up, she would always talk to us about how only pure honey right off the comb was the best honey. She has always complained about how hard it is to find this type of honey so imagine my surprise when I actually found it and at Walmart (in the Hispanic foods aisle). As soon as I saw these glorious jars of honey, I made sure to grab a couple and I immediately knew they would be perfect for my mom! Don Victor Orange Blossom Comb Honey is a raw, filtered honey, not processed or heated in any other way. Oh and guess what; the honeycomb inside can be eaten!! For example, toast a piece of your favorite bread and then with a knife, cut a chunk of the comb and spread it over the toast. It doesn't melt but becomes soft and aromatic and delicious!! 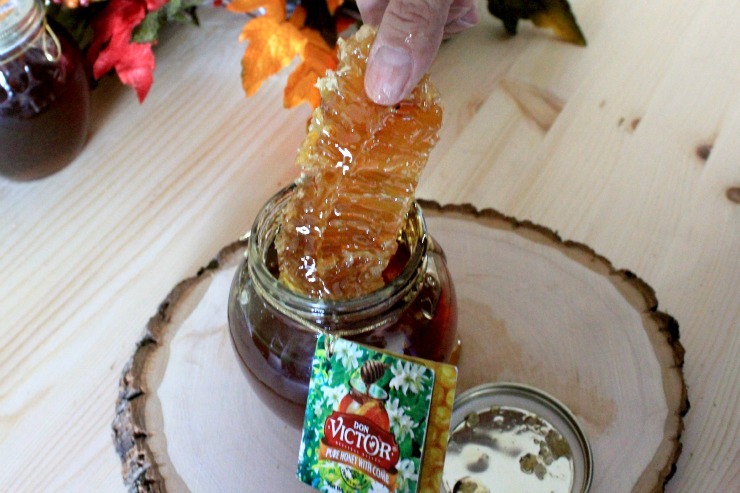 TIP: Always store honey at room temperature! Honey stored in the refrigerator accelerates the honey's crystallization! Back to the gift basket. To assemble the gift basket or box in this case, carefully place tissue paper at the bottom of the box, then place all items inside. I don't want my mom to see this when she visits, so I will close the box, wrap with a big bow and place under our tree until Christmas day! I can't wait until my mom opens her box of tea goodies and sees the honey! She is going to be so surprised. She might be more surprised at the honey than all the hard work I put into the mug, but that's OK! Do you have any pure honey lovers in your life? 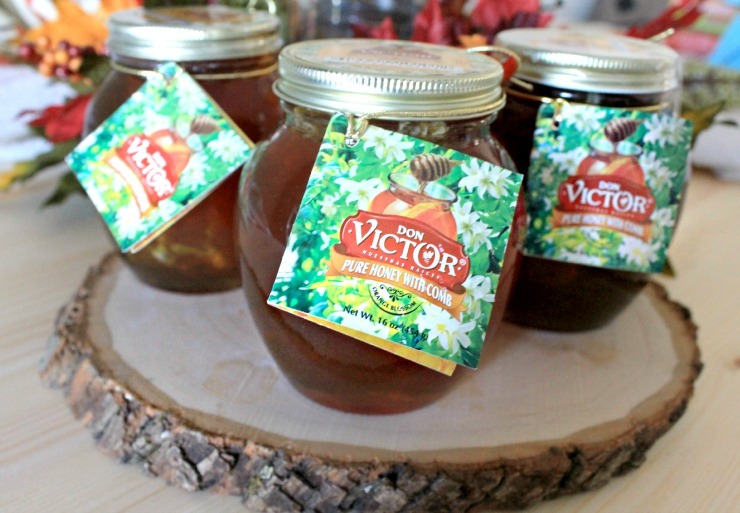 Wouldn't they love a jar of Don Victor honey this holiday season?